The suspect displayed a handgun in his waistband and handed the teller a hold-up note. Authorities sent surveillance photos to media and Crimestoppers received numerous tips as a result, said FBI Special Agent Darrell Foxworth. Anyone with information concerning this robbery is asked to contact the FBI at telephone number (858) 320-1800 or San Diego Crime Stoppers at (888) 540-8477. 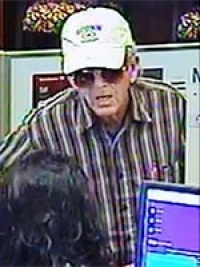 To view photographs of other wanted San Diego bank robbers, please visit https://bankrobbers.fbi.gov.